In continuation of Hockey Week, today we feature the Minnesota Wild. The Wild are the current NHL franchise located in the Twin Cities, since The Minnesota North Stars left for Dallas in 1993. After the departure of the Stars, there was a seven year absence of hockey in the land of ten thousand lakes; Hockey was a way of life in Minnesota and it was clear that this would not be a franchise-less state. Prior to the 2000 NHL season the origins of a team began to sprout. After voting on a new name and colors, a new team was born: The Minnesota Wild. It was clear that the community would appreciate a team, as the franchise had a deal to build their own arena in St. Paul within months of their creation. The Xcel Energy Center seats 18,064 fans, and has a record including standing room with 20,554. In their already ten year history, the franchise has won one division title in 2008, but has yet to win a conference of Stanley Cup Championship. The all time scoring leader for the Wild is Marian Gaborik who has 437 points in 502 games played for the club. 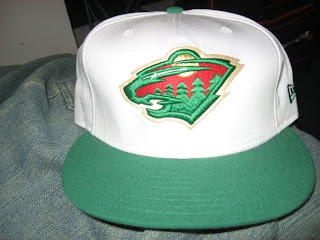 The cap featured has a white crown, a forest green brim with the crisp and favorable Wild logo front and center. There have been many debates of to what the logo actually is, most feel it is either a bear or a wild cat. Either way, it's a great logo which pays homage to the great tradition of hockey in Minnesota. The logo also pays homage to the history of hockey in the twin cities as the North Star is featured as the eye of the wild animal in the logo. Minnesota: a proud state, with a great tradition of hockey, and a bright future in the Wild.